Abingdon Theatre Company -- which has produced 83 new American plays since 1993 -- continues its 22nd Season with A HAPPY END, a new play by Iddo Netanyahu, with previews set to begin tonight, February 27, 2015, prior to an official press opening March 11 in Abingdon Theatre Arts Complex's June Havoc Theatre (312 West 36th Street). Off-Broadway performances run through March 29. Alex Dmitriev (God's Daughter) is set to direct. Set in 1932, A HAPPY END is the story of a Jewish family faced with the decision whether to leave Berlin amid the imminent rise of the Nazi Party. They struggle to believe that Germany's traditions of art, science and democracy will not change as Hitler comes to power. Although the signs of danger are increasing, the family ponders whether to seek an unknown future outside their beloved Germany or stay. "A HAPPY END is not exclusively a World War II or Holocaust story," says Netanyahu about his new drama. "It is about how we perceive events around us, how we truly judge them and what role self-delusion might play in our most important decisions. The play is set in the shadow of the Holocaust so I could be sure the audience knows what choice the family should be making. I imagine that all playwrights, when they write about the past, are really writing about today." A HAPPY END features Curzon Dobell (Levittown, Soho Rep's Peninsula), Carmit Levite (NYIT Award nominee, Best Lead Actresss for The Chekhov Dreams) and Phil Gillen (Drunk Shakespeare, Theatreworks' Charlotte's Web) as members of the Erdmann family faced with the decision to leave or stay in Germany as World War II looms. The cast also features Lori Gardner (My Deah, Fix Me, Jesus), Joel Ripka (Machinal, INTAR's American Jornalero) and Allison Siko (Kathleen Stabler on "Law & Order: SVU," Paper Mill Playhouse's Gypsy). The design team includes Blair Mielnik (set), Katy Atwell (lighting), Laura Crow (costumes), David Margolin Lawson (sound), and Dennis Corsi (projections). Ashley Zednick is Production Manager; Deidre Works is Production Stage Manager. Iddo Netanyahu is a physician, author and playwright whose published works include the novel, Yoni's Last Battle: The Rescue at Entebbe, 1976; and The Rescuers, a collection of short stories. Marking the playwright's Off-Broadway debut, A HAPPY END had its world premiere in Italy with subsequent productions in Germany and Israel. Nina Mazur, a member of the UNESCO Theatre Critic Association, called A HAPPY END, "an outstanding play...deeply impressive... the tragedy of humanity, shown through the eyes of a few individuals." For Abingdon, director Alex Dmitriev helmed the premieres of God's Daughter and Graduation Day by Barton Bishop and Evangeline and God and German Games by Berrilla Kerr. Other New York credits include the Drama-Desk nominated Lost in the Stars (York Theatre Company), St. Nicholas (Irish Repertory Theatre), Let Us Now Praise Famous Men (Village Theatre), Mrs. Warren's Profession (Pearl Theatre), Bedtime Story (Actors Studio) and Jan Buttram's East Texas (York). Regionally, he has worked at Philadelphia Drama Guild, Virginia Stage Company, McCarter Theatre Company, Delaware Theatre Company, Actors Theatre of Louisville, the Cincinnati Playhouse, Merrimack Rep and Actors Lab-Arizona. He was the Associate Artistic Director of Canada's prestigious Manitoba Theatre Centre; Artistic Director of The Toronto Center for the Arts; and was the Resident Director at the North Carolina State Theatre for two seasons. Abingdon Theatre Company is currently celebrating its 22nd Season of producing new plays with mainstage productions, readings, educational initiatives, special events, and much more. Jan Buttram is the Artistic Director of Abingdon Theatre Company; Managing Director is Heather Henderson. 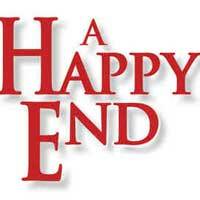 Performances of A HAPPY END run February 27-March 29, 2015: Tuesdays, Wednesdays and Thursdays at 7pm; Fridays at 8pm; Saturdays at 2pm and 8pm; and Sundays at 2pm at Abingdon Theatre Company's June Havoc Theatre (312 West 36th Street, between 8th and 9th Avenues). Tickets are $65, call 866-811-4111 or visit www.abingdontheatre.org.